The Effects of Ethanol on Simple Nervous Systems Purpose: The effects of alcohol has long been studied concerning its effects on the nervous system and motor coordination (i.e. drinking and driving). This Bi-week Scientific AmeriKen will examine the effects of alcohol on nervous systems a couple steps down on the evolutionary scale. The purpose of this experiment will be to deteriment if ethanol has detrimental effects on the simple nervous systems of garden snails. Hypothesis: The hypothesis of this experiment will be that alcohol will have general effects on the snails which include hampering their motor coordination. This hypothesis is based on the assumption that as alcohol is absorbed into the bloodstream it works to surpress the speed at which the nerves communicate messages. Furthermore, that the snail having similar nerve structures as organisms with more complex nervous systems, that the effects of alcohol will then be felt by the snails. Equipment: Needed for this experiment are 3 snails, ethanol alcohol in some form (used in this experiment was Kamchatka vodka), some kind of snail food (orange leaves were used in this experiment) paper, and a pen. Procedure: The first step is to set a point of attractant for the snails. this is done by smearing a food source along the piece of paper in a straight line. The second step is to subject the snails to alcohol in varying amounts. The first snail is the control snail and should remain "sober". 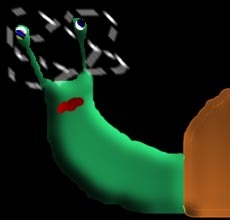 The second snail should recieve a light amount of alcohol. Place it's head in the alcohol for no more then 30 seconds. Finally the third snail should be submerged in the alcohol for no more then 30 seconds. Place all three snails on their own'food line' and observe and plot the directions that they travel. The snail in this run was left unaffected by the ethanol. It moved at a relatively quick pace and usually in a constant direction. However, it does seem to be unattracted toward the orange tree leaves. When the snail first touched the alcohol, a "sizzling sound could be heard, when the snail was placed on the paper, it proceeded to move in a deliberate pace. The Snail stayed in place throughout the course of the study. It however, showed signs of life. Conclusions: Based on the results, it seemed as though the alcohol had no 'intoxicating effects' on the snails. Rather, the alcohol seemed physically harmful to external structures of the snail. It should also be stated that it was not discernable whether the submerged snail was "faded" or was just recovering from wounds. In all, it would seem the hypothesis was proven untrue and simple nervous systems are not effected in the same manner as more complex systems.